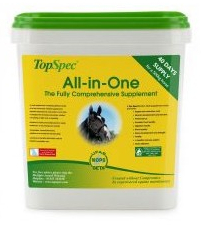 TopSpec All-in-One offers the highest specification nutrition across a broad spectrum of essential nutrients. 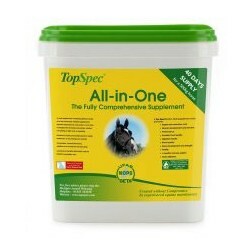 Blending hoof and bone supplements with anti-oxidant rich ingredents and complex digestive aids renders TopSpec All-in-One a complete and thorough dietary aid. As a caramel flavoured, granular based supplement, All-in-One is highly palatable and easy to administer. Designed to complement a horse or pony's daily food rations, All-in-One has an insignificant calorie value but a very significant nutrient value. As a powder supplement, it needs mixing with more than a double handful of suitable chaff. • A fully comprehensive range of micronutrients included at the optimum levels needed to balance feed intake in the most demanding or stressful situations. • Effective levels of Biotin (15mg/500kg horse/day), which, in association with the methionine, lysine, calcium, zinc, copper, iodine and Vitamin A present, will greatly improve hoof quality. Certain of these nutrients also promote supple skin and a very shiny coat. • Powerful levels of Vitamin E and selenium, vital antioxidants, important for muscle metabolism, for horses on high oil rations and for breeding stock. • Methionine and lysine plus minerals, vitamins and trace-elements for optimum muscle and bone development and repair. • Raised levels of copper, zinc and B vitamins and considered levels of iron, important for blood-building. • Effective levels of calcium, phosphorous, copper and zinc to help develop and maintain strong bone. • Generous levels of B vitamins, vital for efficient energy metabolism in the high performance horse, and important for horses with compromised hindgut function. from the fibrous parts of their diet. ii) A mannan oligosaccharide (MOS). This is a natural component of yeast cell walls. It bonds with pathogenic (bad) bacteria, removing them from the gut, leaving the beneficial bacteria free to multiply. Below are some recent questions we've received regarding Top Spec All in One Supplement for Horses, including answers from our team. How long does a 4kg tub last? The 4kg tub will last a 500kg horse 40 days.